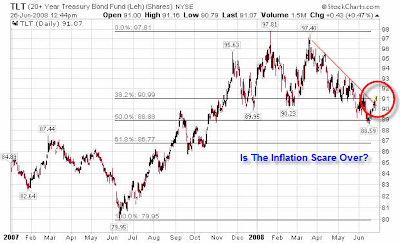 Mish's Global Economic Trend Analysis: Is The Inflation Scare Over Yet? Is The Inflation Scare Over Yet? Treasuries have been on a bit of a rally recently as the Lehman iShares 20+ year duration treasury fund (TLT) chart shows. The recent downtrend line has been broken. Is the inflation scare over? That is hard to say. It's much easier to say is that it should be. Destruction of credit via massive writedowns in banks and financials, accompanied by sharply rising unemployment rates, falling wages, and curtailment in credit lines everywhere is simply not an inflationary environment. Of course, this all starts with a proper definition of inflation. In Austrian economic terms, inflation is an expansion of money and credit. Money is not expanding and neither is credit. There is an illusion that they are as discussed in Bank Credit Is Contracting. We have reached Peak Credit, a once in a lifetime event. Those focused on the CPI, M3, and other such measures are completely missing the boat. Yes, the CPI is understated (at least on the surface). However those using CPI data to short treasuries over the past few years have had their heads handed to them. OK there was a selloff from March to June, but seasonally this is an expected event. April and May are typically the worst months (tax season). A warning shot was fired at the treasury bears today as circled above. Will they heed the warning? Some choose to call what is happening "credit deflation". In this regard "credit" is an unnecessary label. Deflation is about the contraction in money supply and credit. The conditions now are very similar to what happened in 1929. The primary difference is that prices of many goods and services (notably energy and food) have been rising. China and India are on a different credit cycle than the US. Inflation in China is indeed rampant. Just so that it is clear, I am talking about monetary inflation. Monetary inflation is really the only kind, but confusion keeps cropping up so I spell it out. China is printing Renminbi to buy US dollars. The US dollar is falling because of budget monstrosities by this administration and both parties in Congress. Fiscal conservatives are rare. In fact, other than Ron Paul, I cannot name one. So a weak dollar policy by this Administration coupled with inflation elsewhere is masking the actual deflation in the US (for those incorrectly fixated on prices). Ok, so the price of milk and vegetables have double (or whatever). That is irrelevant in comparison to the mammoth destruction of "perceived wealth" in houses. Home prices in many areas have fallen by a third or even a half. Some condos have no bid at all. Rapidly rising housing prices were massively understated in the CPI on the way up and are massively overstating CPI inflation now. Those focused on the CPI failed to see any chance of the Fed Fund's Rate at 2.00 again. On the other hand, those focused on the destruction of credit from an Austrian economic perspective got this correct. That is just one reason why it makes more sense to watch the credit markets than the CPI. The second is the CPI is so distorted it is useless. In my opinion, it is very likely new all time lows in the 10-year treasury yield and 30-year long bond are coming up. The worst in credit writeoffs lies ahead. I was laughing that the pundits on Bloomberg yesterday talking about the breakup value of some of the banks. Value? There is no value in most of them. There is heaps of debt that will be defaulted on. Banks like Washington Mutual (WM) and Wachovia (WB) are enormously overloaded with Pay Option Arms (i.e. the liar loans). 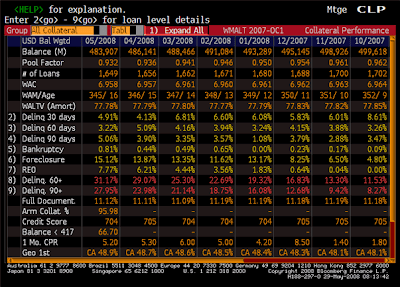 Most of these loans were rated "Alt-A", a step above subprime (at least in theory). Massive problems are surfacing big time in those liar loans. The Housing Wire is reporting Alt-A Performance Gets Much Worse in May. A new report released by Clayton Fixed Income Services, Inc. on Wednesday afternoon found that 60+ day delinquency percentages and roll rates increased in every vintage during May among Alt-A loans, while cure rates have declined only for 2003 and 2007 vintages. The picture being painted for Alt-A is increasingly beginning to look a whole lot like subprime, as a result, even if peaking resets in the loan class aren’t expected until the middle of next year. In particular, loss severity continues to ratchet upward — a trend that portends some likely further reassessment of rating models at each of the major credit rating agencies, as they catch up with the data. Those numbers make Standard & Poor’s Ratings Services latest assumption of 35 percent loss severity on Alt-A loans, only one month old, already start to look a little too conservative. 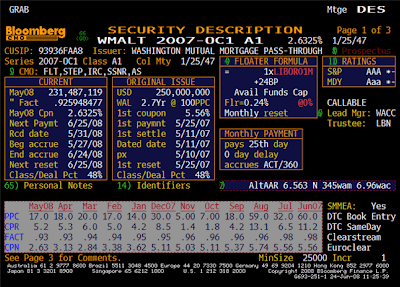 I have been following one Alt-A pool, WMALT 2007-0C1, since January. Every month the defaults rise. Chris Puplava has helped out by providing some of the charts. Thanks Chris! 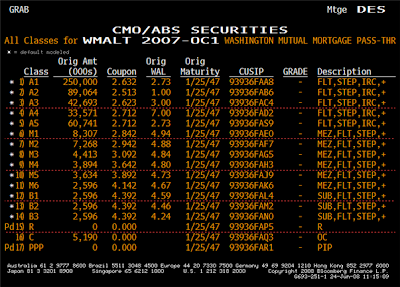 The most recent discussion of WMALT 2007-0C1 was Bring On The Alt-A Downgrades. I have some new charts today that highlight how far behind the curve Moody's is. The new charts are from "CZ" at a global fixed income management firm. Admittedly this is just one pool, but it seems to be indicative of what Housing Wire is saying. First let's start with the most recent snapshot of the pool. 22.89% of the whole pool is in foreclosure or REO status after 1 year. I now have a tranche list and a breakdown, by tranche of the current ratings. Let's look at the rating of tranche A1. The M1 tranche and below (10 tranches in all) have all been downgraded to BBB or below. The top 5 tranches constitute $476.069M out of an original pool size of 519.159M. In other words, 91.7% of this entire mess is still rated AAA. Look at the first chart again. 31.17% of this cesspool is 60+ days delinquent, 15.12% is in foreclosure, and 7.77% of this pool is in REO status. Here is the key stat: 15.17% foreclosed and 91.7% is still rated AAA by Moody's and the S&P. If this is indicative of what is happening in other pools, and I suspect it is, the number of tranches downgraded by Moody's is a very misleading indicator. Have Moody's and the S&P have been downgrading the lower rated tranches, (higher in number but way lower in volume), while ignoring the big problem? It sure looks like it. The big hit is coming when those "A" tranches get downgraded. Expect more credit writedowns. Lots more. What's happening is not inflationary in any way, shape, or form. Gold was up big today. Some look at gold as a sign of inflation, some as an inflation hedge. The reality is that it is neither, except perhaps in the extreme long term. There was positive inflation from 1980 to 2000 yet gold fell from 800 to 250. As an inflation hedge, it would have been hard to pick a worse one! And if gold is rising because of inflation now, why was it falling for 20 years when there clearly was inflation all the way? Let's look closer. Historically, there are times gold does well: Hyperinflationary times and Deflationary times. Gold does poorly under more normal conditions, and gets hammered in disinflationary conditions, a falling but positive rate of inflation. If gold is signaling anything right now, it is the further destruction of fiat credit (deflation) as we move from disinflationary conditions to deflationary ones. Gold rose in the great depression, and it is poised to do so again. Recent action (the last several years) in gold is very consistent with deflationary theory about the destruction of credit. Gold, unlike fiat, is no one else's liability. Money with that attribute (and gold is money), should rise under these conditions. 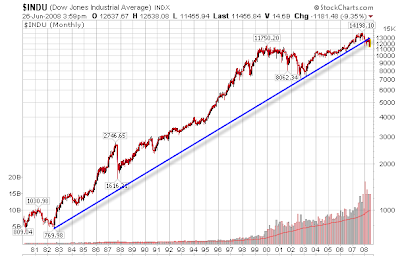 The long term trendline headed all the way back to 1982 is busted. This is not an event to dismiss lightly. 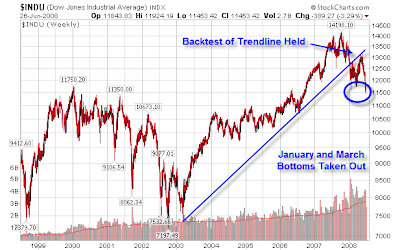 Not only did the Dow break it's long term trendline, it broke its yearly low, and shorter term trendlines as well. The close today in the markets can only be described as ugly. This is not a crash call, but please remember: Crashes occur in oversold conditions not overbought ones.